Lake Chapala is Rated by National Geographic as among the Best Climates in the World … The semi-tropical climate in Lake Chapala, Mexico is probably the first major attraction to the area. What will the weather be like during your stay? 1. Buy the Moon book on Guadalajara for excellent information on this area. 2. Pack casual clothing – with layers in mind for changes in temperatures. 3. No need to bring all your good jewelry as this is a very casual village. 4. Only bring good walking shoes for our cobblestones (no high heels). 5. Include: flashlight, sun hat, any medication you need to take (alarm clock & umbrella provided in each unit). 6. Bring your laptop – We have both wired & wireless internet access. Electric is the same in Mexico, so no adaptors required. 7. Chapala is a ‘peso’ society so make sure you have money to access your ATM card (FYI – ATM machines dispense pesos through your dollar account). 8. Credit cards are seldom taken in Chapala. Lake Chapala may just be paradise for those who enjoy dining out and eating wonderful, creative food. This guide to favorite restaurants is ranked according menu selections, service, ambiance and price. Buen Provecho! Read about Life in Mexico-travel, cuisine, history, business, culture and art, and locations you may want to visit. Find out about the towns that make up Lake Chapala-Chapala, Ajijic, San Juan Cosala, Santa Cruz, San Antonio, Jocotepec, Xtlahuacan – All close enough to visit during your stay. Leave nothing to chance! 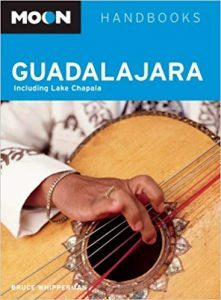 Here is a comprehensive guide to all things Lake Chapala – Services, Events, Dining, Entertainment, Menus, Maps, Activities- Find anything you need!